Stencil calculations and matrix-free Krylov subspace solvers represent important components of many scientific computing applications. In these solvers, stencil applications are often the dominant part of the computation; an efficient parallel implementation of the kernel is therefore crucial to reduce the time to solution. Inspired by polynomial preconditioning, we remove upper bounds on the arithmetic intensity of the Krylov subspace building block by replacing the matrix with a higher-degree matrix polynomial. 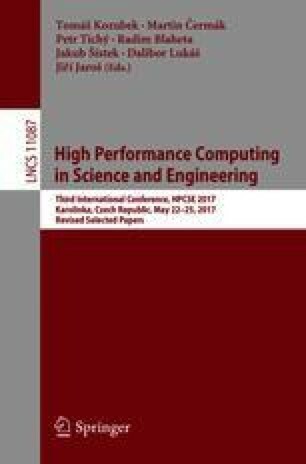 Using the latest state-of-the-art stencil compiler programs with temporal blocking, reduced memory bandwidth usage and, consequently, better utilization of SIMD vectorization and thus speedup on modern hardware, we are able to obtain performance improvements for higher polynomial degrees than simpler cache-blocking approaches have yielded in the past, demonstrating the new appeal of polynomial techniques on emerging architectures. We present results in a shared-memory environment and an extension to a distributed-memory environment with local shared memory. We thank Uday Bondhugula for helpful correspondence and upgrades of PLUTO, Karl Rupp for the data in Fig. 2, and Radim Janalik for initial results used in Fig. 5. We acknowledge the Swiss National Supercomputing Center (CSCS) and the University of Erlangen for computing resources. This research has been funded under the EU FP7-ICT project “Exascale Algorithms and Advanced Computational Techniques” (project reference 610741).